That's because President Donald Trump is not looking for a fluffy sidekick at the moment. 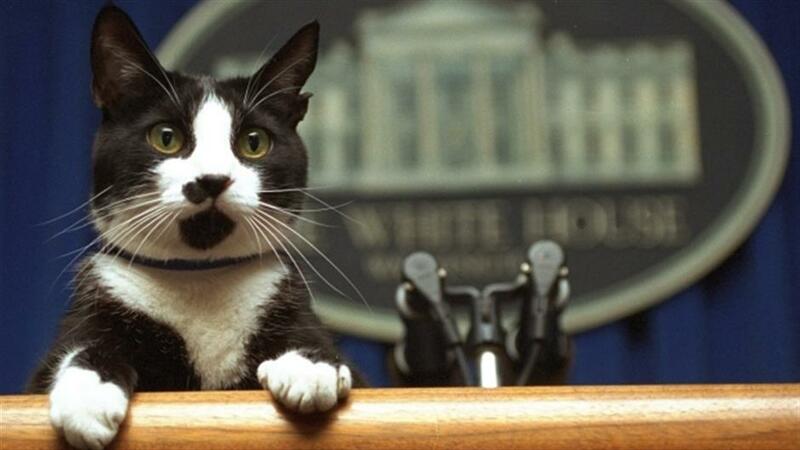 In this March 19, 1994 file photo, Socks the cat peers over the podium in the White House briefing room in Washington. Politically ambitious pups and kittens: Put your resumes aside. That's because President Donald Trump is not looking for a fluffy sidekick at the moment. Asked about plans for a four-legged addition to the White House, Stephanie Grisham, a spokeswoman for Melania Trump, said in a statement: "The first family is still getting settled so there are no plans at this time." If Trump stays pet-free, he will be breaking with a long held tradition of presidential pet ownership. President Franklin Delano Roosevelt's had his beloved terrier Fala. President George H.W. Bush's English springer spaniel Millie was featured on "The Simpsons." When President Barack Obama's family acquired their Portuguese water dog Bo, it was big news. "In the modern-day presidency, almost all of them have had a pet," said Jennifer Pickens, a White House social expert who wrote "Pets at the White House." Still, she noted, "all didn't necessarily have them at the beginning of the administration." Power and pets have long gone hand in hand. "For some reason people in power, they end up suffocating different opinions and dominating their staff, but they in some ways long for someone who will speak up to them, and a pet will," said Doug Wead, a former George H.W. Bush administration staffer who wrote books on presidential children and the 2016 campaign. Wead noted that political pets can sometimes be used for, well, politics. He recalled an event after Millie had puppies that was "carefully choreographed so guests could see all these little puppies." "It was calculated like a state dinner," he said. While there have been notable pets in the White House for generations, Millie was the first modern White House dog, said Pickens. She added that Barbara Bush was the first one to "use the pet as a tool to reach out." The former first lady wrote "Millie's Book: As Dictated to Barbara Bush," which reached the number one spot on the New York Times nonfiction best seller list in the fall of 1990. The newspaper's description: "The memoirs of the English springer spaniel who lives in the White House." Hillary Rodham Clinton in 1998 followed Bush's lead, with a children's book about family dog Buddy and cat Socks. "Dear Socks, Dear Buddy: Kids' Letters to the First Pets" featured photographs of the pets, details on their habits and more than 50 letters from children to the pets. During President George W. Bush's administration, when the White House was closed for tours after 9/11, the administration tried to connect with the public through videos. Among them was the "Barney Cam" series of short videos featuring the Scottish terrier having adventures in the West Wing, with cameos from the first family and White House staff. When he declared victory in the 2008 presidential race, Barack Obama told his daughters: "You have earned the new puppy that's coming with us to the White House." Several months later, Bo joined the family, a gift from the late Sen. Ted Kennedy. Bo quickly became a household name, appearing on morning television shows and in videos promoting the White House Easter egg roll. Some notable pets belonged to first kids, including Amy Carter's Siamese cat Misty Malarky Ying Yang and Caroline Kennedy's pony Macaroni. The Kennedy family had a veritable menagerie of pets, complete with dogs, cats, birds, hamsters and a rabbit named Zsa Zsa. Going back in White House history, some presidential pet stories get more outlandish. According to the Presidential Pet Museum website, President Martin Van Buren was given a pair of tiger cubs that he donated to a zoo and President John Quincy Adams was presented an alligator. While Trump has not embraced presidential pet ownership, Vice President Mike Pence has picked up the slack. The Pences have a bunny, Marlon Bundo, and a cat named Pickles. Another cat named Oreo recently died. And they just added two more pets to the household — puppy Harley and cat Hazel. They also installed a beehive. Pickens said she doesn't know that it matters if Trump gets a dog, but she said they are "effective tools to connect with the American people and I think pets help humanize the presidency." Of course, while pet ownership can provide personal and political perks, it can also go wrong. Former GOP presidential candidate Mitt Romney was dogged by criticism for admitting that during a 1983 family vacation, he strapped his Irish setter — in a pet carrier — to the roof of his car for a 12-hour drive from Boston to Canada.